Spot.Us: a new way to fund civic journalism? As a supplement to today's CNN.com story on "hyperlocal" news Web sites, here's a bit more on Spot.Us, a site where the public pays journalists to write specific stories about the San Francisco Bay Area. David Cohn, the site's founder, is one of many entrepreneurs trying to find a way to fill the news holes left as newspapers layoff more reporters. On the site, freelance journalists pitch specific news stories and explain why it is important that the idea be explored further. If the site's fans agree, they can make a donation - sometimes just $10 or $20 - to pay the journalist to produce the story. 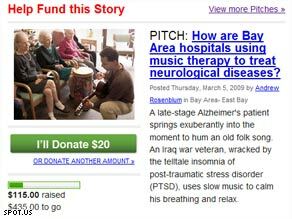 This method of "crowd funding" has paid journalists to create 22 stories since Spot.Us launched in November, Cohn said. One journalist currently proposes a multimedia project about the Bay Area's biggest environmental concerns. The project's cost is estimated at $1,500 and the public had contributed more than $880 as of Monday night. Once a story is fully funded and produced, it is sold to news media organizations, or, if there's no buyer, given away for free, Cohn said. The site's funding model allows stories of civic importance to be told and makes paid journalists more accountable to their audiences, he said. "There's something to be said that journalists are responsible not to their editors, but responsible directly to the public, right?" he said. "On Spot.Us, you are commissioned by the public and you are responsible to the public." Spot.Us is focused on the Bay Area for now, but may expand into cities like Los Angeles and Boston in the near future, Cohn said. He stresses that Spot.Us will not be able to fix all of journalism's problems. It probably wouldn't be able to replace the news produced by the San Francisco Chronicle if the newspaper went under, for instance, he said. "I’m optimistic about Spot.Us, but I am also realistic, which is to say Spot.Us is not a silver bullet - because there’s no such thing as a silver bullet," he said. "It is part of the solution. It is a new way of generating revenue so we can tackle important" social issues. People need to experiment with new ways to tell the news as much as possible, he said. "I think what journalism needs is 10,000 different start-ups," he said. For more on "hyperlocal" news, check out this explainer and the main story on CNN.com. What sites do you all find interesting? Will this work? What ethical issues does "crowd funding" post? Weigh in with comments to this post. There's one brilliant highlight in the spot.us story – David Cohn is making the software available to any organziation that wants to go and do likewise. If you have a desire to create a community-funded journalism site in YOUR hyperlocal area, contact spot.us and Digidave will share what he's learned and what he's built. And if you're a person who cares about the future of journalism, you might want to support spot.us, minnpost.com, or any other similarly community-supported effort, even if they're not in your community. Models of success will beget others. Thanks for the comment! Good point. John is right on with this story. I recently completed a survey of the business community and members of the media (current and former) regarding the future of news. All agree that we are in a very changing time for presentation of news. To that end, I am in the process of launching a series of business news websites nationwide. The first, http://www.FloridaBusinesForum.com, will be the test template. Businesses, not-for-profits, ad and public relations agencies will be able to become a member of the business forum and upload their news, video, photographs, and podcasts free of charge. Every state in the nation will have a similar site. There are a lot of out of work journalists who are eagerly watching to see how this news venue develops. And, a lot of businesses and agencies eager for new opportunities to place their news. There is just a stock page up now on the site, but you will be able to see more as the real site is completed and launched within the next 30 days. you should watch Michael Jackson's fureanl on Fox News Channel. it has the best news coverage for everything. Fox News is seeing stronger ratings than ever with the addition of some new programs and the change in administrations. so far during prime time, FNC is averaging 2,495,000 total viewers, well ahead of CNN’s 1,254,000 and MSNBC’s 984,000 combined.